New York, March 17 (CNA) Visiting Taipei Mayor Ko Wen-je (柯文哲), a potential independent candidate for Taiwan's presidency in 2020, told New York University students Sunday that the one thing to avoid when running a country is believing one can change it overnight. Ko has yet to confirm whether he will run in the presidential race, but the fact he could is of great interest to Taiwan's media thanks to his popularity among young voters. The workshop with NYU students drew a full house of 400 on Sunday. The outspoken physician-turned politician told the audience how he went from a career as a doctor at National Taiwan University Hospital to mayor of the capital city. In a 30-minute speech, Ko said that he has always thought of the U.S as "honest," adding that although President Richard Nixon resigned in 1974 due to the Watergate scandal, "Taipei political circle would be empty if anyone telling a lie had to step down." He also said that in his 20s, he wanted to topple the Kuomintang (KMT) government, but that his thinking changed after enrolling in a research program at the University of Minnesota in 1993. After one year in the U.S., he started to realize "making negative comments about others doesn't make you a better person and overthrowing a negative power does not necessarily make a country great." If he has inspired Taiwanese young people, it must be because he has faced challenges with courage, the 59-year-old Ko said at the workshop. Asked by a Chinese student what he would do to address domestic and diplomatic issues if he becomes the leader of Taiwan, Ko said it took Amsterdam 40 years to build a complete bicycle track network, and Taipei originally gave itself just two to three years to achieve the same goal. Such an approach is doomed to fail, he said. "Never imagine you can change the whole country or the whole world overnight," he said, "people must always know their goal and general direction, and then insist on getting there." "Be patient and keep going," Ko advised. Earlier in the day, when asked by reporters during a tour of the South Street Seaport in Manhattan about his strengths on issues such as cross-strait relations or independence, Ko said the best thing as an independent mayor is that he has no political baggage. His approach to KMT and Democratic Progressive Party city councilors is the same. And he is free from the influence of business, the mayor added. Ko flew from Taipei to New York Saturday to begin a nine-day visit, which will also take him to Washington D.C., Atlanta and Boston. On Sunday Ko had a breakfast meeting with Andrew Nathan, a professor of political science at Columbia University, attended by Taipei City Government spokesman Liu Yi-ting (劉奕霆), deputy spokesman Chen Kuan-ting (陳冠廷) and Yang Ching-hui (楊慶輝), chief executive officer of the international affairs committee of Taipei City. Nathan told reporters after the meeting that the U.S. is curious about Ko and his stance on cross-Taiwan Strait issues. Washington will want to learn more about him, he said. Specializing in Chinese politics, Nathan is the author of the authoritarian resilience theory, under which the Chinese regime is believed to have survived through constant institutional renewals without entering the process of democratization. 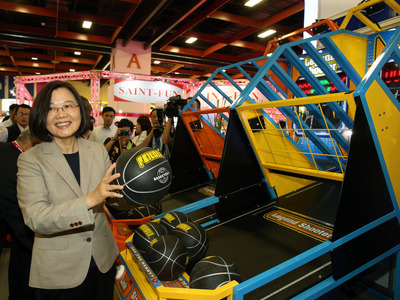 Taiwan's Deputy Foreign Affairs Minister Hsu Szu-chien (徐斯儉) was his student.